One thing I miss about the southwest is the abundant variety of Mexican food the area offers. I often find myself in the mood for a casual, affordable, interesting meal from a number of Mexican-inspired genres I was familiar with from growing up in the Phoenix area- some of which don't seem to be implemented very well in the Boston area. However, after searching around off and on the past decade I've found a few restaurants that are serving up some outstanding food. There are a few formats within this group I'd like to talk about. I'm a fan of almost all of them, and always on the lookout for more so I thought I'd offer up six styles of Mexican food establishments and the best representations I've found in the Boston area for further discussion. Leave a comment below and let me know what you've found that you think others should check out. This is the food I have a taste for on a near-daily basis. It's the kind of place where you get a burrito smothered with enchilada sauce and cheese along with rice and beans and all the free chips and salsa you can eat. Cold Coronas are readily available. Some old guard Phoenix area favorites include Serrano's, Mi Amigos, Macayo, and Garcia's. Over time ambitious restaurants impressed as well: Tia Rosa, Garduno's (evidently now defunct and/or renamed Camarones), and Abuelo's. This category is increasingly represented nationally or near-nationally, but beware of weak implementations of the concept in the northeast which ultimately doom the franchise. I've had lousy meals at a Garcia's in Albany (now defunct), and On The Border restaurants in the northeast (whereas I think they're pretty good closer to Mexico). This isn't really what I'm talking about- neither here in Boston or back in Arizona. This is fine dining inspired by regional Mexican dishes. This category is enthusiastically represented locally. The menu is almost exclusively burritos and usually chips and salsa. You order at the counter, take delivery of the food, find your own seat and clean up after yourself. Bonus points to restaurants with a salsa bar- an unfortunately rare commodity in the Boston area. Best representation near Boston: Anna's Taqueria, Qdoba. Chipotle is still my favorite. Note: Burrito places like Boloco serve up tasty food but they're really not trying to serve up Mexican food. Sure you can get a decent burrito with Mexican ingredients buts the presence of Thai, Buffalo, and Teriyaki burritos tell us where their allegiances lie. It's with the burrito- not Mexico. Here you order from a menu that's similar to the sit-down chips, salsa and Corona restaurant but you take it to go or seat yourself. There's tons of these in Arizona ranging from the very authentic Filibertos to the more mainstream Someburros. In looking at some Yelp reviews in this space I see mention of Taco Bell as a reference point in this category. I'm not sure what to say about that. On one hand it's a format many are familiar with so it's worth discussing. On the other hand so much of the menu is contrived it's hard to say what Taco Bell does for the national discussion on Mexican food. At any rate there aren't even many Taco Bells in the Boston area and most are paired with a KFC. Best representation near Boston: Still looking but Boca Grande in Brighton isn't bad. Tell-tale offering: More than just burritos and tacos are available. Look for the presence of at least an enchilada on the menu. You see these all over the place in the San Diego area. Beer battered fish with cabbage and a unique spicy slightly-creamy dressing on a soft corn shell. Quite a delicacy. Pelly's in Carlsbad is excellent and Taco Surf in Pacific Beach is pretty good too. I've heard great things about Wahoo's Fish Taco as well. Rubio's is a chain I'd love to see in the area, but if Baja Fresh couldn't make a go of it, I highly doubt Rubio's would be successful. My inspiration for writing this up was a visit to Dorados in Brookline, MA. Check back soon for a full write-up. Special Note: Ironic that Baja Fresh isn't Baja-style. My point in writing this up was to highlight subtle differences between restaurants in the broad Mexican food category and perhaps catch a few comments for restaurants to check out within each of these categories. For as much enthusiasm as there is for the category in the Boston area, many national chains seem to fail when they attempt to expand here. I don't know why that is exactly. Is it that Bostonians don't like chains? Or that the chains are poor implementations of the concept somehow? Question of the Day: What do you think of the state of Mexican food in the Boston area? Any gems you've discovered? I miss the The Sit Down Chips & Salsa and Corona Mexican Restaurant so much. About once a week I have a craving. I can not find a replacement in Boston. Whenever I visit home in Southern Virginia my family always plans at least one outing that includes one of these restaurants that are abundant at home. No matter which restaurant you go to the menus are the same and you know you can count on combination #1 or the Speedy Gonzales. As a local burrito connoisseur, and fan of all things Tex-Mex, and Mexican and so on I think you're leaving a couple places out. In Cambridge (my hometown) we've got Felipe's Taqueria in Harvard Square and Boca Grande, who began the local burrito trend that spawned Anna's, Felipe's, and others years ago. 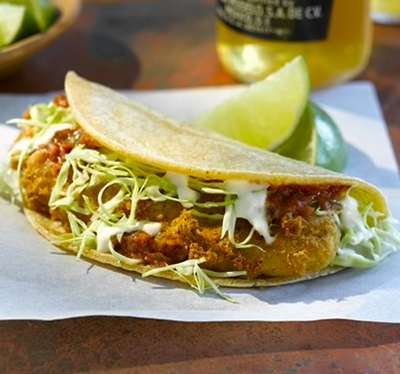 Also there are a number of places where you can pick up a good fish taco in the area (though I make no claim to know whether they're authentic incarnations). The Border cafe in Cambridge does one, as well as Jose's in Somerville. I vaguely remember reading a best of the local fish taco scene article in a magazine recently as well. I personally make a point of avoiding Chipolte as they were once owned by McDonald's, and thus aggravatingly super-chain by association. Mexico Lindo in Melrose, MA has decent mexican food. Their tamales are authentic, but sadly, not very good. Jose's in Cambridge, MA has good chips & salsa, but the entrees vary in quality a lot. Sometimes good, sometimes awful. It's been some time since I've been there, though, perhaps things have changed. Both places serve Chile Relleno and Tamales. These are my litmus tests for a Mexican restaurant. I wouldn't say there are great Mexican restaurants in MA / New England, but these and others are passable. I think authentic Mexican food, in general, will always have a tough time in MA. People have preconceptions that make it tough for restaurants to offer real dishes that aren't altered to match. As much as MA foodies claim to be open minded about spice and heat, most restaurants hold back. Street patrons usually will not like anything loaded with cilantro and lime, and restaurants pay for it when they don't get repeat business; even if their interpretation is on point. Ingredients are also a problem. For example, good jalapeno peppers are not found frequently in MA. These and other core ingredients in sub-par form make for rather lackluster cuisine; a cook can only do so much with ingredients that have to travel thousands of miles to arrive at a diner's plate. An honor to receive your comment here. Your coverage of the College Square Pizza situation is inspiring. I appreciate your tips and intend to follow-through and try the ones I haven't had before. You touch on a couple of buzzwords that intrigue me. First: Authentic. When I was writing this up I really wanted to avoid getting into anything disparaging about places that aren't authentic. My impression of authentic is based on the food I experienced growing up in Arizona and visiting southern California. That food is an American interpretation of authentic Mexican food but to me it's what I'm looking for. My point: No worries about being inauthentic. It just needs to be good and what I'm looking for. Second: Tex-Mex. I don't know what Tex-Mex means really. Growing up in Arizona I didn't see the term used anywhere but when I've been to Texas and visited restaurants they seemed slightly different than what was called a Mexican restaurant in Arizona. There was somehow more emphasis on BBQ I think and that influence was unfamiliar to me. What does Tex-Mex mean to you? Serious question. I've scanned the Wiki page for Tex-Mex and I'm still confused on the nuance vs. what I'm familiar with from Arizona. Thanks again for checking-in. I appreciate it. Oh, I'm aware of the McDonalds association with Chipotle but I've got to call it like I see it. I haven't seen a better burrito in Boston. Yet. Bob - the others we mentioned last Friday are Ole in Inman Square (in the fine Mexican dining category), and their outpost for tacos in Brookline, Olecito on Cypress St. We've tried Ole many times and love it, especially the margaritas and made-by-the table guacamole. The reviews of the fish tacos at Olecito are great so we're going to try it soon. We also tried La Verdad by Fenway recently and it was yummy. Michael especially liked their tripe taco (!) and I liked all three I tried: fish, turkey, chicken mole. Oh, and I almost forgot one of our favorites, that started the conversation: El Pelon, which used to be in the Fenway but now is right by the Boston College stop on the Green line. Their fish tacos are fantastic! I'm glad that there's a Mexican restaurant at Massachusetts. I'm always craving for tacos and enchilladas and now it's easier to have one because this restaurant is just a few blocks from us. My favorite Mexican Restaurant is the Burrito Bar because their Burritos is one of the foods served at the Long Island weddings I've been to. I love the taste because it's spicy.